The moon's first quarter phase is the best time of the month to observe its craters and "seas." A moon in the first quarter phase,such as we will haveover the next few nights, is the best time to gaze the lunar surfacewithbinoculars or a small telescope. At first quarter, the sunlight isfalling on the moon fromits right side (left side as seen from the Southern Hemisphere). Alongthe linedividing day and night on the moon, called the terminator, the shadowsarelong, and the slightest surface features stand out in stark contrast. Begin your studyof the moon by noting the largest features, the dark plainsof ancient lavaknown by the Latin name "maria," singular "mare." Earlyastronomers were unaware that the moon had no atmosphere and thoughtthesebroad lifeless plains were seas and oceans. At first quarter, three mariadominate themoon's surface. 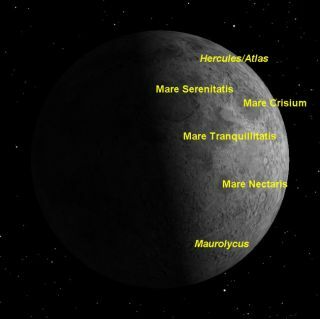 From north to south these are the MareSerenitatis (Sea ofSerenity), the Mare Tranquillitatis (Sea of Tranquility), and the MareNectaris(Sea of Nectar). Between the first two and the edge of the moon is thesmallercircular Mare Crisium (Sea of Crises). Notice how the maria tend to beconcentrated on thenorthern half of the moon, while the southern half is mostly highlands,pockmarked all over with craters. Long ago in the north, lava flowsfrom thehuge maria swamped the ancient craters. Here and there you may seetheir ghosts,however. All of the larger craters on themoon are named, mostlythe names of ancient astronomers. At first quarter, one of the mostspectacularcraters is Maurolycus. This crater, 71 miles (114 km) indiameter and nearly 3miles (4.8 km) deep, is named for a 16th century Italian mathematicianwhoopposed the theories of Copernicus. The people who named themoon'scraters carefully placed Maurolycus and Copernicus onopposite sides of themoon's disk to keep these two from arguing. At the far northern edge of thefirst quarter moon is aninteresting pair of craters named for the two mythical strongmen,Hercules andAtlas. Hercules is 43 miles (69 km) in diameter and has a large craterin itsfloor. Atlas is 54 miles (87 km) in diameter and has a flat floorcrisscrossedby so-called rilles ? the remnants of collapsed tubes of lava. One of the most interesting thingsto do while observingthe first quarter moon with a small telescope is to concentrate on aparticularcrater and watch in real time while the sun rises over it. At first the crater will beengulfed in shadow. Then abeam of sunlight will illuminate the central peak and the far wall.Gradually,as the sun rises, more and more of the crater floor will be revealed. If you return to an area youstudied carefully a nightlater, you will be surprised to find almost nothing visible. The topography of the moon is, inreality, very slight,and only reveals its details when lit by the glancing rays of therising orsetting sun. That is why the first quarter moon is so appealing toamateurastronomers. This article wasprovided to SPACE.com by StarryNight Education, the leader in space science curriculumsolutions.